Address: Saint Petersburg, Palace Embankment (in Russian - Dvortsovaya naberezhnaya), 34. A tiny beautifully decorated Hermitage theatre with only 250 seats was designed in Italian style in 1787 by the prominent architect Giacomo Quarenghi on the base of the former winter residence of Peter the Great. It is located on the Neva Embankment and is linked to the other palaces accommodating Hermitage collection. Its walls are decorated with pink and yellow artificial marble adorned with Corinthian columns. In the spaces between columns are niches where yuo can see statues of Apollo and the Nine Muses, busts and medallions of Moliere, Racine, Voltaire and other figures of literature and art. The arc over Winter canal serves as the theater lobby from which opens a wonderful view of the Neva river. The architect Quarenghi wrote about his creation: "I strived to give the theatre an antique appearance while at the same time satisfying modern requirements. It is spacious enough for the most magnificent performances to be presented there. The semi-circular form of the amphitheatre was chosenfor two reasons. In the first place, it is the most convenient form for the spectators. In the second place, when seated, every spectator can see all the others and this looks very nice when the house is full". Since the Hermitage theater opening in 1785 and till October revolution (1917) it was the private theater of Catherine the Great and her successors where many famous artists were performing. The repertoire of almost all European theatres was presented on the stage of the Hermitage Theatre. For some plays and musical shows - comic operas and comedies - the Empress was writing libretti herself. In 1991 after the reconstruction of the building the performances here resumed. Today visiting this comfortable and elegant theater you can feel yourself Russian aristocrat and enjoy the classical ballet and opera performed by young and talented graduates of St. Petersburg Vaganova Ballet Academy and Conservatoire. 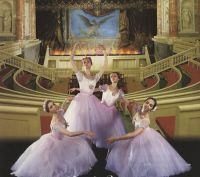 In the theater of the Hermitage you can see the famous Russian ballets (Swan Lake, The Nutcracker, etc) with participation of the best dancers in the city, concerts, classical concerts and opera. The Hermitage Theatre is also famous for special shows that are given on it's stage. Say in 1995 the famous Russian musician Sergey Stadler gave two concerts here playing on unique violin "Canonne Guarnerius"- the first valuable and the most favorite instrument that belonged to Niccolo Paganini. In this theatre the seats are not numerated and the spectators are free to choose where to sit. To have more choice it is better to come early enough. Perfomance time: 19.30 - 20.00.